"Dad, Make No Bones About it, You're Top Dog!" 1. Draw a picture of a dog with a bone in it's mouth as shown in the picture. If you would like the ears to flop down, draw the ears straight up so that when you cut them out you can bend them down as shown in the picture. Patterns for this craft are available to members only. 2. Cut out the dog, fold down the ears, and glue it to another piece of paper or card stock. 3. 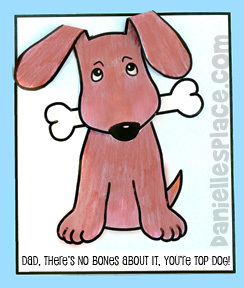 Write "Dad, there's no bones about it, you're Top Dog!" on the bottom of the card. Note: This card uses two idioms. An idiom is an expression or phrase whose meaning cannot be deduced from the literal definitions, but refers instead to a figurative meaning that is known only through common use: "No bones about it" - no doubt, and "Top Dog" - the best. 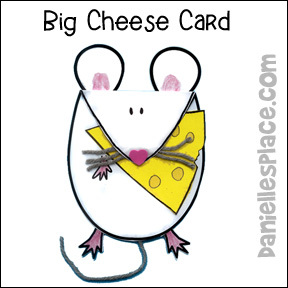 Also the "Big Cheese" card and the "Apple of my eye" card below, use idioms. You can use these cards to introduce idioms to your children. Two-and-a-half-year-old Logan made this card with his dad. He compared the dog on the card to his own floppy-eared dog. 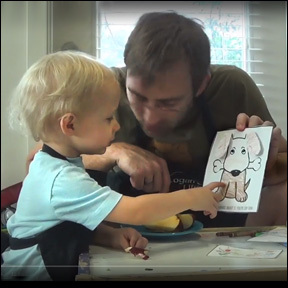 You can watch Logan making this card on "Logan's Life" to see how your toddler might like to make this craft. "Dad, You'll Always be Top Dog with Me!" You lift me up when I am down. Even when I don't have anything to say. You carry me when I can't carry myself. 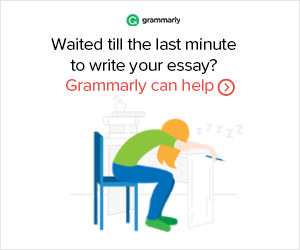 You let me help even when I'm not very helpful. 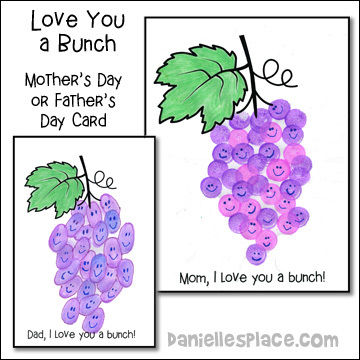 This card is available in color or in black and white. Print out the pattern and glue it to a piece of construction paper. 1. Print out the bear pattern and the bear's clothes pattern. 2. Color the bear and cut out the clothes patterns. Use the clothes patterns as a template to trace onto textured paper. Cut out the clothes and glue them onto the bear. 1. Print out the Pattern or draw a large egg shape on a piece of card stock. Cut out the pattern. Fold down the top of the egg shape to make the mouse's face. Cut out ears and feet shapes and glue them to the mouse. 2. Cut yarn for the whiskers and the tail and tape them to the back of the mouse so that they can be seen from the front. Glue a pink fun foam heart on for the nose or cut a nose shape from construction paper. 3. Cut a cheese shape from yellow construction paper and draw on little circles for the holes. Write "Dad, you're the Big Cheese" on the piece of cheese and stick it in the mouse's mouth. Tape it to the mouse so it doesn't fall out. 1. Print out the pattern and cut the cards out. 2. Color the dogs and fold them as shown. 1. Make sure your can is clean and there are no sharp edges. 2. 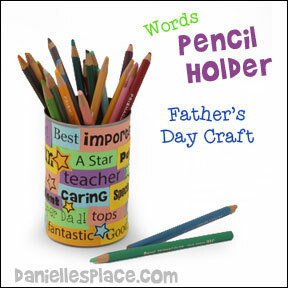 Cut out words from magazines describing your dad or use the free printable words pattern. Print the pattern out onto different colors of paper and cut around the words. 3. Glue the words to the can. 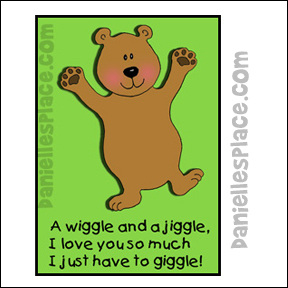 The little bear on this card wiggles back and forth. 1. 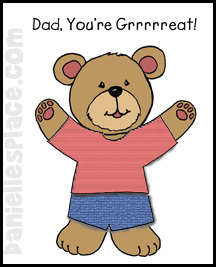 Print out the pattern for the bears, cut them out and color them. Cut out the curly cue looking thing on the solid lines to make a snake. I can help my dad build a dog house. I can help my dad dig. I can help my dad pack. I can help my dad at the store. I can help my dad pick berries. I can help my dad build things. I can help my dad plant a tree. I can help my dad with the camp fire. I can help my dad fish. 1. Print out the book and assemble the pages. 2. Read "Just Helping My Dad" by Mercer Mayer. 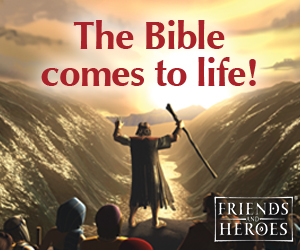 You should be able to find this book in your local library. After reading the book ask your child if he or she noticed that in every picture there are little critters. Go through the book, page by page, and help your child find the spider, mouse, and any other little critters on each page. 4. Visit the Little Critter Web Site to find out more about Mercer Mayer, download apps, print out coloring pages, read interactive books, download songs, and much more.